Live the Bondi lifestyle no matter where you are. Wear it to the beach, take a dip in the water or just take in the sun. Dress it up with a buttoned shirt and stroll over to a bar for a relaxing drink. Designed to stretch, they are also great for the gym – Feel confident while hitting those PRs or posing for a selfie, you’ll look amazing either way! The Icon Belt is made from 100% genuine Italian leather and can be worn with anything. Elegant and understated, the Icon belt features beautifully textured leather and a custom buckle. Looks amazing with the Bondi Shorts! 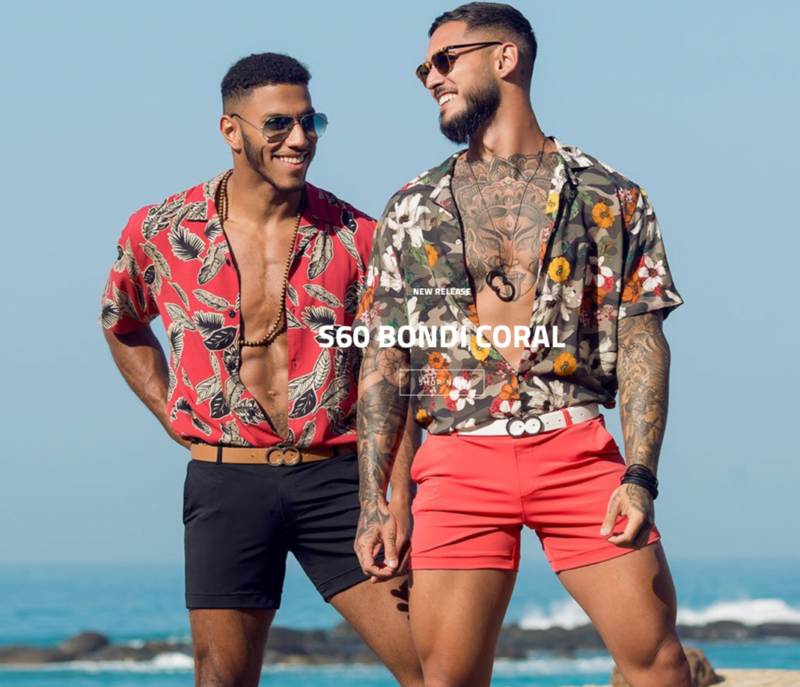 2eros S61 Long Bondi shorts are back and now available in long or short versions and look amazing with the icon Belt. Perfect match for summer 2019. The original Icon shorts started 9 years ago right here. The Icon Shorts are designed to show off your gains at the beach or at the gym and have people mirin. These shorts will support you in all the right places. Party season is here — the time to start RSVP’n for an event every weekend, buying new outfits, and letting loose! Party season is all about having fun and indulging, so your outfit should be, too! Whether it’s a pool party or underwear party, we’ve got you covered with our 3 key rules that won’t steer you wrong. Make this party season your best one yet! A low-rise and form fit flatters every body type and creates that slim lined ‘V’ shape silhouette. Furthermore, it visually lengthens your torso. When it comes to textures, it’s all about mixing solids with prints. The contrast provides an eye-catching juxtaposition to your outfit. Channel your inner James Bond by keeping it sophisticated. Find strong, bold colors and splash in some floral to build on that iconic look. Okay, this sounds like a no-brainer, right? Well, if you’re second-guessing what you’re wearing then change. Nothing is worse than being out and constantly adjusting or worrying about how you look. If you feel confident and comfortable in what you’re wearing, it will shine through and make you look and feel amazing! Now that you know how to put together the perfect outfit to get you through this party season, it’s time to kick back and enjoy the festivities. Whether it’s a pool party or underwear party, you will be looking and feeling confident.